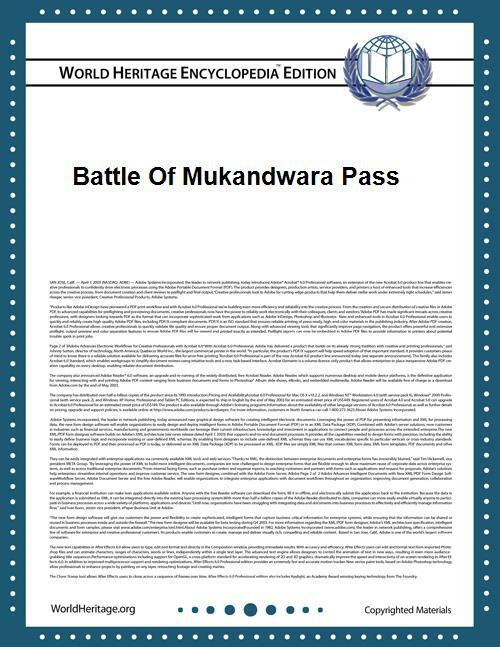 The Battle of Mukandwara Pass, also known as Monson's Retreat (8-9 July 1804) was fought between forces of the Marathan Maharaja Yashwantrao Holkar and British East India Company forces under Colonel William Monson during the Second Anglo-Maratha War. It was fought just to the south of the Mukandwara Pass, about 50 kilometres (31 mi) south of Kotah. Monson, having overextended his supply line, was retreating toward Kotah when Holkar's forces decimated his rear guard on 8 July, and engaged his main force the next day. After these clashes, Holkar continued to harass Monson's force, which was badly mauled by the time it reached the safety of Agra in August. This Indian history-related article is a stub. You can help World Heritage Encyclopedia by expanding it.